The recent demonetization of high valued currency notes by the Indian government has created interest in both national as well as international circles with debates ranging from intent to its long-term effects on the economy. While this move will certainly assist in temporarily weeding out some proportion of black money and slow down funding of anti-national activities, it is its effect on ‘cash’ that needs to be closely tracked. Cash currently comprises over 12% of GDP with more than 68% of transactions by value and 95% by volume still being cash based in the country. While a cashless economy certainly sounds like a herculean task given these statistics, the government has been taking major steps in this direction in the last few years. Several measures have been taken in the last few years to ensure financial inclusion and improve digital connectivity. The Prime Minister’s Jan Dhan Yojana (PMJDY) has added 25.51 crore accounts to date since its launch in mid-2014. Moreover, RuPay debit cards issued with every PMJDY account was aimed to familiarize the poor hitherto unaccustomed to the use of plastic money to give it a try. Efficient use of Aadhar to ease KYC norms have resulted in easing the process of opening bank accounts. The goal of ensuring every household in India holds a bank account seems realistic today as compared to a few years back. By 2020, India is expected to have 730 million internet users, with 75% of new user growth expected to come from rural areas. While 71% of the estimated 371 million mobile internet users are from urban India currently, the number of mobile internet users from rural areas in 2015 was double that in 2014 and is witnessing unprecedented growth this year. The Digital India drive is set to provide broadband connectivity to over 250,000 gram panchayats across India and increase adoption of data enabled services. The recently launched Unified Payment Interface (UPI) effectively taps into smartphones to transfer money between accounts using a virtual payment address (VPA) and eliminates the need to key in account and bank details for every transaction. Mobile wallet providers like Paytm and Mobikwik are targeting a much larger base of smartphone users even as they are standing in long winding queues in front of ATMs enticing them to move away from cash to their products. Mobile wallets are forecasted to witness 60x growth in number of transactions till 2020. While this move is inarguably a very expensive and bold experiment by the government with more than 1.28 lakh crore estimated to be the cost of this entire exercise, it will need to be supplemented with many more stringent actions if the country must achieve monetary as well as moral benefits out of it. At the same time, it is very important for all stakeholders including the RBI, banking institutions, businesses as well as the common man to play an active part and do their bit to move towards a more transparent economy. The government on its part is already working on stringent Benami transaction laws as well as sharing of foreign account information to tighten and monitor flow of money into obvious black money havens of real estate and foreign accounts. Laws to declare gold purchases and track flow of cash into bullion need to be set up soon. Implementing GST soon will pave the way for uniform taxation. 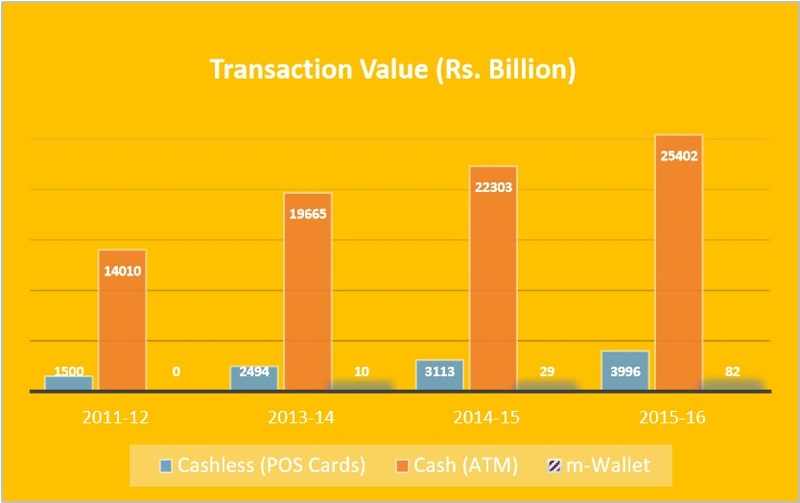 The RBI needs to look at reducing transaction charges on card payments and levy a penalty on cash withdrawals to discourage use of cash (over 90% of debit card transactions currently are cash withdrawals). Banks will need to play a major role in educating rural India of the advantages of moving to digital payment methods and must gain the trust of their customers through timely and innovative actions. Micro ATMs and deployment of micro-finance circuits to educate villagers would be a good start. Businesses need to realize the advantages of transparency and build effective auditing mechanisms to ensure clean book keeping. The common man needs to actively adopt digital payments where possible, educate his immediate network on its usage and adopt tax compliance. Deposits in banks due to demonetization by Dec 30 2016. Number of tax payers in 2016-17 (currently, this number is a dismal 1% of total population). Year over Year increase in tax collection (both from amnesty measures as well as yearend). 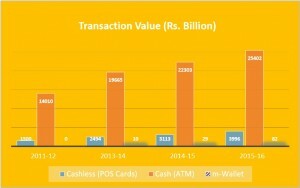 Cash transactions as a percentage of total transactions every year up to 2020. Total dormant bank accounts by 2020 (currently, 43% of bank accounts are dormant). mWallet usage every year up to 2020. The not-so-quantifiable parameters like the government’s intentions will be the topic of many debates to come. For the common man however, this is a golden opportunity to break away from a cash based economy to a ‘less-cash’ economy to build a much more transparent India for our future generations.